Issue transactions are created whenever you fulfill a user's request for items from your inventory. The amount and cost of the items issued will subtract from your total on-hand quantity and cost of that item. Required fields are indicated by a red check box ( ). 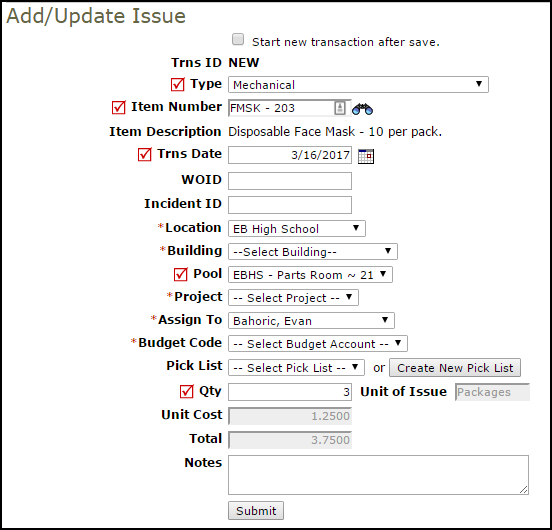 Issue Transactions can also be created directly from a work order in MaintenanceDirect. Entering an New Issue Transaction in the Transaction section of a work order will automatically create an Issue in InventoryDirect. Any MaintenanceDirect user that has access to enter transactions on the work order can perform this action without being a user in InventoryDirect. You can add up to five Issue transactions at a time using the Clerk form. Click on the Issue tab at the top of the screen. You can also click on the Issues link in the Information & Analysis section of the home page. From the My Issues list, click on the New Issue (Clerk Form) link in the Shortcuts section at the top of the page. On this page, you can enter up to five issue transactions at one time. The field headings in the bar at the top correspond to the entry fields in the columns below. Enter the Quantity of the item you are issuing out. The Unit of Issue, Unit Cost, and Total Cost will all fill in for you based on the information on the Inventory Item. Enter a WOID if needed. This will enter information into the other fields for you. Or you can select that information manually. Click on the Issue tab at the top of the screen. You can also click on the Issues link in the Transactions section of the home page. From the My Issues list, click on the + Add New Issue link on the right side of the list. If you are issuing this item for use on a work order, enter the WOID. This will populate the Location, Building, Project, Assign To and Budget Code fields automatically with the information from the work order. An Issue transaction will also be recorded in the Transaction section of the work order. If you are not issuing this item to a work order, you can select Location, Building, Assign To, and Budget Code as needed. You can assign this issue to a Pick List if needed.